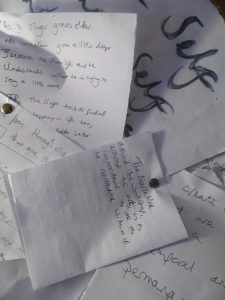 In the office (and no doubt, also soon to accumulate in the studio) I have a pin board piled deep with scribbles, notes and quotes on random pieces of paper. As an artist who am I? Is who I am as an artist related to who I am ordinarily? Or are my identities completely intertwined? How do I see my practice? What is my philosophical approach? Does my approach mirror those of practitioners from other disciplines i.e. writers, chef’s, musicians?